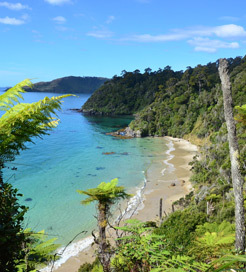 Stewart Island is the third largest in New Zealand, lying 30 kilometres south of the mainland’s southernmost tip. Known by Maori as ‘the land of the glowing skies’, it attracts hikers, birdwatchers and kayakers, alongside nature lovers simply looking to unwind on a sandy beach with the magnificent Aurora Australis on the horizon. If you’re searching for an island off the beaten track, then Stewart is for you. Over 85% of it is national park and it has just 28 kilometres of road, compared to 280 kilometres of walking tracks. Also, as one of the most untouched areas in the country, it is home to around 20,000 Brown Kiwi, the country’s native and endangered bird species. Stewart’s beauty is not refined to its land or skies; on a guided kayak tour you’re likely to spot penguins, dolphins and seals enjoying themselves in the pristine waters too. The island offers one of New Zealand’s nine Great Walks as well; the 39 kilometre, 3 day long Rakiura Track. Along this tranquil but challenging trek you’ll come across some of the common sea and forest birds, climb a 250 metre high forested ridge and navigate across the gorgeous Paterson Inlet. For accommodation, you can either camp or book in advance a night’s stay in one of the Great Walk huts. After your hike, recharge your batteries in New Zealand’s southernmost pub, the South Sea Hotel in Oban which is renowned for serving exquisite fish and chips. Ulva Island, in the heart of the Paterson Inlet, is a predator-free environment for rare birds including the South Island saddleback, mohua and rifleman species. This beautiful islet also offers idyllic beaches, large picnic areas and sublime views across the bay. There are a few crossings provided each day, lasting around an hour, departing from Bluff on the South Island and arriving in Oban on Stewart Island's east coast. For more information, please visit our Ferries from New Zealand to Stewart Island page.